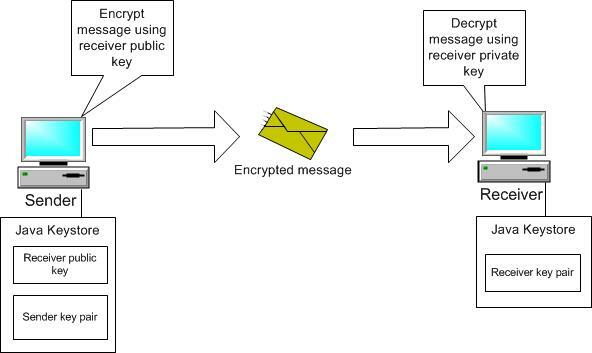 CXF security uses asymmetric algorithms for different purposes: encryption of symmetric keys and payloads, signing security token and messages, SSL transport bindings. If you look in samples and tutorials, the public keys (in form of X509 certificates) are normally stored in java keystores. Seems to be OK? Imagine now that you have production environment with 100 different clients of this service and service certificate is expired. You should reissue and replace certificate in ALL client keystores! Even more, if keystores are packaged into war files or OSGi bundles – they should be unpackaged and updated. Not really acceptable for enterprise environments. Therefore large service landscapes have concept of central certificates management. It means that X509 certificates are not stored locally in keystores, but are provided and administrated centrally. 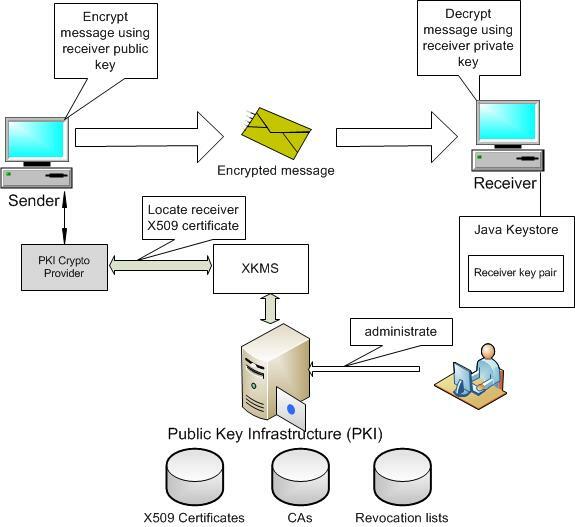 Normally it is a responsibility of PublicKey Infrastructure (PKI) established in organization. PKI is responsible for create, manage, store, distribute, synchronize and revoke public certificates and certification authorities (CAs). b) Key Registration Service responsible for registration, revocation, recovery and reissuing of keys. Note, that beginning from CXF 3.0.0, XKMS service and client implementation as well as XKMS Crypto Provider (see next chapter) will be available in CXF distribution. Fine, assume your organization has established simple PKI infrastructure and provides some kind of remote access to look up and validate the certificates (Rest or SOAP XKMS based). The question now is the following: how to configure my CXF client and service to use public certificates not from local keystore, but from central PKI? Is there any easy way to do it? Fortunately yes! CXF uses WSS4J for most of security aspects and WSS4J has own concept of crypto providers (don’t mix them with crypto providers of Java Cryptography Architecture). WSS4J crypto providers are responsible to obtain X509 certificates and private keys, verify X509 trust chain and construct X509 certificates. WSS4J crypto providers must implement Crypto interface. WSS4J also provides base abstract class with common functionality CryptoBase and keystore based implementation of crypto provider Merlin. Frist method looks up and returns X509 certificates based on CryptoType identifier. CryptoType specifies certificate identifier as subject DN, issuer DN and serial number, alias, thumbprint or SKI bytes. "Cannot instantiate default crypto provider: "
throw new IllegalArgumentException("Not supported cryptoType: "
As far as crypto provider makes a lot of remote calls, it makes sense to care about certificate caching. CXF distributions (starting from version 3.0.0) will contain XKMS based WSS4J Crypto implementation, so you can just reuse it. How CXF and WSS4J know that they should use our custom crypto provider instead standard Merlin? There are some ways to configure it. You can specify own crypto provider in keystore properties file. ws-security.encryption.properties says CXF that clientKeystore.properties will be used for the encryption. WSS4J will instantiate and call our PKICryptoProvider automatically. The same keystore properties can be specified for signature as well (ws-security.signature.properties). Sometimes more convenience way is to instantiate custom crypto provider explicitly. For example, if you want to inject proxy to communicate with PKI into PKICryptoProvider or use non-default constructor. For such cases CXF provides ws-security.encryption.crypto and ws-security.signature.crypto properties. You can pass pre-constructed PKICryptoProvider object using these properties. Of course you can use the same approach to configure PKICryptoProvider for CXF service (jaxws:endpoint). In this blog we have discussed requirements and use cases to use central certificates management infrastructure, showed how to create custom PKI based crypto provider and configure it in CXF clients/services. PKI crypto provider can be used for communication with Security Token Service (STS) and inside STS to validate X509 certificates as well. But it is topic for the next blog.